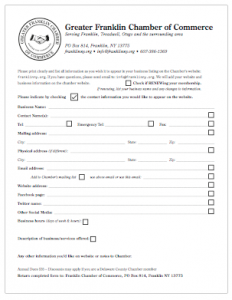 Become a member of the Greater Franklin NY Chamber of Commerce and support our local economy. Be sure to add whatever information you wish to see in your online Member Directory listing. Membership is $35 per year. If you are also a Delaware County Chamber of Commerce member, or would like to join the county chamber, you should use their membership form to join both chambers and get a $15 discount. The Greater Franklin NY Chamber of Commerce will receive the full $35 annual dues. Download membership form on this page, or fill out the online form below to pay online. Information you provide here is for our records only and will not be publicly shared. You will decide further down which information you'd like us to show in the member directory. Most information, especially if you are renewing, is optional -- for example, if you don't have a website, just skip the question. Required information is marked with an asterisk. Since you are renewing your membership we have your information already. Just give us your business name, fill in any information you'd like to add or change, then you can skip right to the payment options. This is how we can reach you urgently. It's not necessarily public. Please list when you are open for business, if applicable. You can list each day on a line of its own (press '+' for new line), or simply enter something like M-F.
Feel free to enter a sentence or two describing your business or services in more detail. You might indicate your specialties, if you are seasonal, etc. Please choose each item you would like us to list in our business directory. If you have a logo you'd like on your online listing you can upload it here. If you have any other comments or suggestions for us, please let us know above. When we receive your check we will update our website to include your listing. Thank you for supporting the Greater Franklin NY Chamber of Commerce, our area -- and your business! After entering your billing address you will be taken to Paypal to complete your transaction. You do not need a Paypal account nor need to sign in to Paypal -- Paypal will just securely process your payment and transmit it to the Chamber. When we receive your payment we will update our website to include your listing. Thank you for supporting the Greater Franklin NY Chamber of Commerce, our area -- and your business!